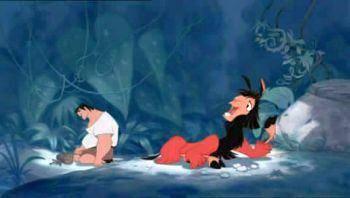 EMPEROR KUZCO AS LLAMA: Well, whatever you call it, it was disgusting. And if you would've done what I ordered you to do in the first place we all could've been spared your little kiss of life. But now that you're here, you will take me back to the palace. I'll have Yzma change me back, and then I'll start construction on Kuzcotopia. Oh, yeah. PACHA: Okay, now look. I think we got off on the wrong foot here. I just think if you really thought about it you'd decide to build your home on a different hilltop. 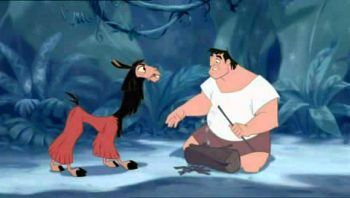 EMPEROR KUZCO AS LLAMA: And why would I do that? PACHA: Because, deep down, I think you'll realize that you're forcing an entire village out of their homes just for you. 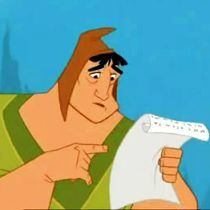 EMPEROR KUZCO AS LLAMA: And that's bad? PACHA: Well, yeah. Uh, nobody's that heartless. EMPEROR KUZCO AS LLAMA: Now take me back.